Habitat: Cattleya araguaiensis is native to the area of Goias, Brazil where it is found growing between 1300 to 2000 meters in elevation. Plant Size: Medium. 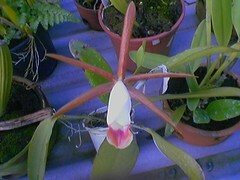 Cattleya araguaiensis produces thin, spindle-shaped pseudobulbs that have a single narrow terminal leaf. Flower Description: Each pseudobulb of Cattleya araguaiensis produces a single flower. The flowers have narrow, olive brown petals and sepals. The lip is tubular and light in color with a dark olive-green and rose patch near the tip. Additional Information: Cattleya araguaiensis was first described to science in the 1960's.